High performance, variable frequency, excellent usability and flexible to meet the needs of your application. Up to 200% torque from zero speed ensures reliable starting and accurate speed control under all load conditions. Future proof. Allows upgrade to the latest generation of high efficiency permanent magnet motors. An internal filter in every Optidrive P2 saves cost and time for installation. Saves space, cost and time for installation. 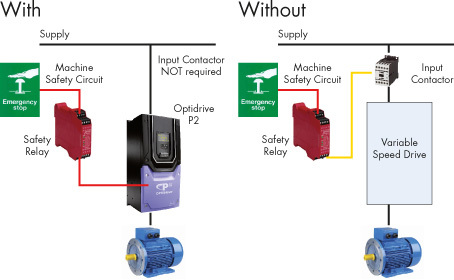 Optidrive P2 features a safe torque off function to allow simple integration into machine critical safety circuits. Simple machine design reduces component costs, saves panel space and minimises installation time. Faster shut down and reset procedures reduce system maintenance time. Better safety standard compared to mechanical solution. Better motor connection. Single cable with no interruption. The P2 Variable Frequency Drive has been uniquely developed to allow a wide range of different motor types to be used, with only parameter changes being required. This technology allows the same drive to be used in a wide range of applications, allowing OEM's and end user alike to take advantage of the energy saving provided by using the latest motor technologies. The majority of AC motors in use today around the world are standard induction motors. These motors are relatively low cost, readily available and provide good performance with long service life. With the ever increasing focus on energy efficiency, motor manufacturers have refined and improved their designs in recent years. 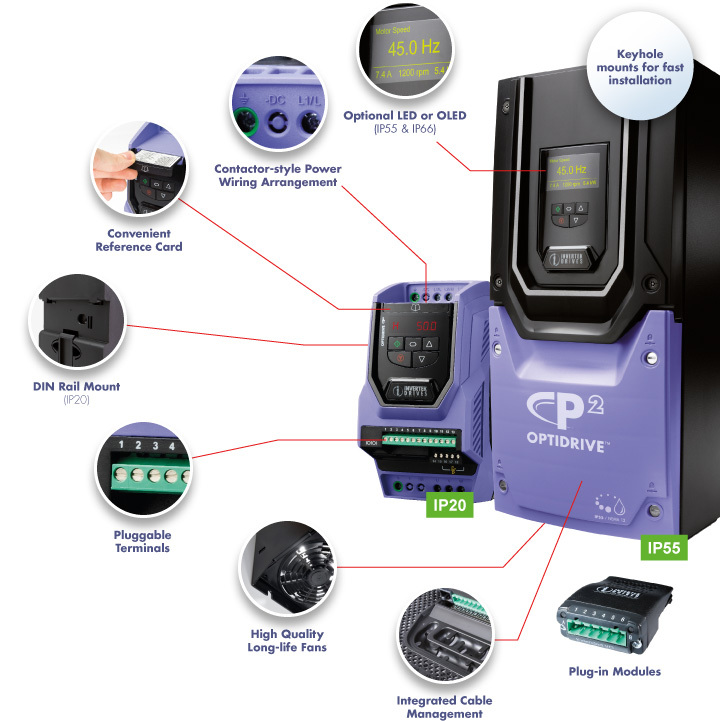 Optidrive P2 has been developed to provide optimum control and maximum efficiency when operating with older motors designs, or newer high efficiency designs. Operation can be in simple V/F control mode or in High Performance Third Generation Vector Mode, which provides up to 200% torque from zero speed without requiring an encoder. Permanent magnet AC motors provide improved efficiency compared to standard induction motors. Using permanent magnets in the motor construction eliminates the need for any magnetising current, reducing electrical losses. PM motors have been used for many years in high performance applications, however this has always required the use of a feedback device, such as a resolver or encoder. Optidrive P2 has been designed to operate with AC PM motors without requiring any feedback device, allowing them to be used for their energy efficiency benefits without incurring extra cost and complexity in applications which do not require position feedback. BLDC motors are similar to AC PM motors, however the design requires a slightly different control method to optimise the performance. Optidrive P2 has the flexibility to control this type of motor, requiring only simple parameter changes. This provides much greater flexibility for OEM's, allowing Optidrive P2 to be used in a variety of applications, with various motor types. Synchronous Reluctance Motors (SynRM), not to be confused with Switched Reluctance Motors, share a similar stator construction to standard induction motors, however the rotor is substantially different, in order to improve the overall efficiency of the motor. SynRM motors are ideally suited to variable torque applications. Optidrive P2 can control synchronous reluctance motors, allowing the energy saving benefits to be realised. 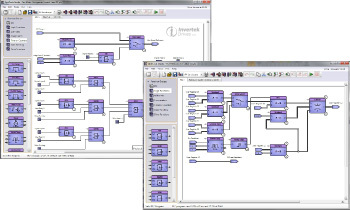 All blocks can be easily combined to create flexible programs. Programs can be protected to prevent unauthorised copying. Complete control over the drive including all inputs and outputs.